Augustus. 27 BC-14 AD. 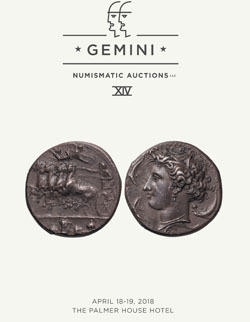 Denarius, 3.75gg. (9h). 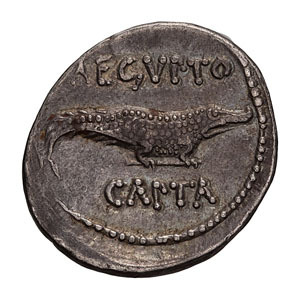 Unattributed mint, 28 BC. 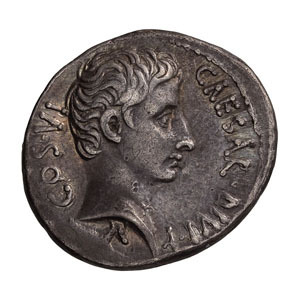 Obv: CAESAR DIVI F - COS VI Head bare right, small capricorn below neck. Rx: Crocodile standing right, jaws closed; AEGVPTO above, CAPTA below. BM 653. Paris 929, pl. XXXVI (same obv. die). Cohen 4 (30 Fr.). RIC 545 (R3). This reverse type commemorates Octavian’s capture of Egypt and victory over Antony and Cleopatra, in essence marking the end of the Roman Republic and the beginning of the Empire. aEF/EF. NGC 4625019-019. Ex Berk 151, 1 November 2006, lot 331, there with pedigree "Ex Roy Buchanan Collection".